Presented is a 25-card complete set of T38 Union Cigar Stores "The Aviators" non-sports cards issued in 1911. 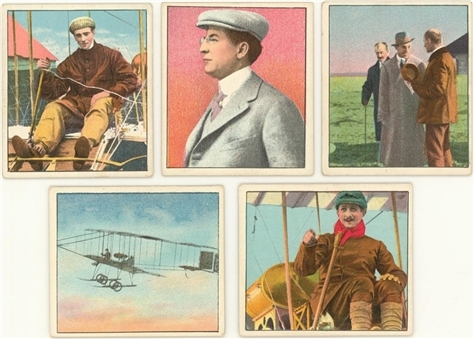 These approximately 2-1/2" x 2-7/8" scarce collectibles showcase marvelously artistic, pastel portrayals of their subjects: the famed pioneers - including the Wright Brothers - and flyers from the earliest days of aviation! Grades 44% VG to EX, 56% lesser (some due to glue residue on the reverse).